When working the Air flow can reach 35 SCFM at 100 PSIG inlet with 10 PSIG pressure drop. non of them are bought from other companies , this can ensure to control the quality of the item . All the size are strictly standard during production,Each part of the A-40SF Quick Coupler Socket is made by cold heading machines by ourselves, A-40SF can be used widely in pneumatic components , the Max working Pressure is 150 PSI with working temperature between -20℃ to 107℃ . couplings are distinguished by their high quality and durability. Their safe, easy one-hand connection and disconnection enables superior operability. Steel coupling is suitable for air. Brass or stainless steel is suitable for water. Note tha fluid will come out from the plug when disconnected. Looking for ideal One Touch Auto Quick Coupler Socket Manufacturer & supplier ? We have a wide selection at great prices to help you get creative. 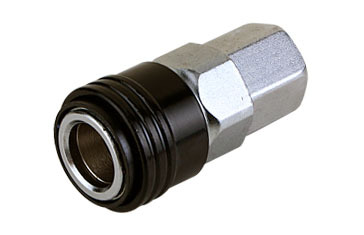 All the 1/2 Female Thread Quick Coupler Socket are quality guaranteed. We are China Origin Factory of Nitto A40SF One Touch Quick Coupler. If you have any question, please feel free to contact us.